Ever let your yogurt go a little too long, or get a little too warm? I do. Although its disappointing to have separated whey and “cottage cheese” in place of the creamy yogurt I was expecting, the curds and whey don’t have to go to waste. Today I’m pouring about 2 cups of whey over 2 cups of oats for use in High Protein Waffles tomorrow morning. 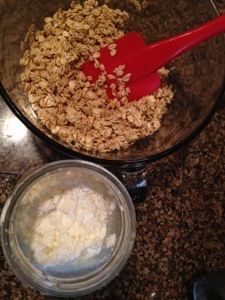 The curds can be used as part or all of the cottage cheese in the recipe. • any baked recipe which calls for buttermilk, such as biscuits or pancakes. In this case, the more sour the better! It may be necessary to use all the curds and only part of the whey so the batter is not too watery, and to blend thoroughly. This presents a great opportunity to soak the grain or flour in the recipe for 12 hours or longer. What creative uses have you found for over-cultured dairy?